This addition to the series of concerts will be perfect for the hard rockers and metalheads among us, with No Funeral, Green Altar, and Emphatic Scorn in the lineup, along with KRFF benefit alum Demifiend and Barnaby Jones. Recently I had the opportunity to sit down with Clark Kotte of Barnaby Jones to talk about the band and the show. 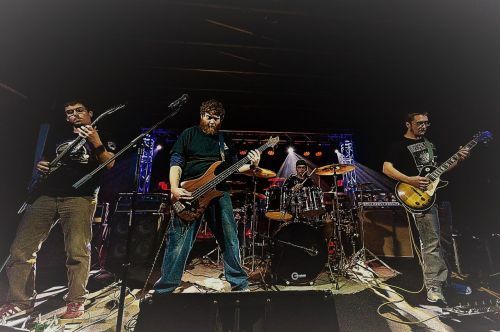 Barnaby Jones is currently a four-person band comprised of Clark Kotte on guitar, Brent Ulstad on drums, Sean Barnes also on guitar, and Justin Turmo on bass and vocals. Barnes and Kotte are the primary songwriters for the group. All the members of the band have been active in other musical projects. Ulstad was in Paige Marshall, Sequoia, and Ingamar. Barnes was in The Gremlins and The Waking, and Justin was in Escaping Corinth and Killform. Ulstad and Kotte had performed five years together, originally in a band called Obscuro with a drummer who only went by Paco. The band called Barnaby Jones came into being about two years ago, starting out as solely instrumental but now including vocals. They took their band’s name from a character on the show “Frisky Dingo” on Cartoon Network’s Adult Swim programming block. In an additional attempt to be tongue-in-cheek and show they don’t take themselves too seriously, their band t-shirts prominently feature Killface, another character from “Frisky Dingo”. “Every other metal band has skulls on their shirts,” said Kotte. “We’re one of the few bands in town that uses all tube amps,” said Kotte, who designs many of the speaker cabinets for the band himself. “We try to have our own designed sound.” This difference in sound extends beyond their mashup of genres, however, Kotte wanted to stress. Kotte noted that, even though he would consider himself a metal fan, he noticed that many metal groups have a fixation on subject matter and imagery that is grotesque, morbid, or dark. Barnaby Jones attempts to be a breath of fresh air in that regard. Recall the humorous genesis of their name and their band t-shirts. “I want people to come away feeling happier,” Kotte said. And though that approach may be a bit unorthodox in the world of metal, that certainly doesn’t mean they rock any less hard, as summer concertgoers will find out at the Aquarium. Doors open at 8, Music at 8:30 p.m.